The most striking finding of this year’s Monitoring the Future (MTF) survey of drug use and attitudes among 8th, 10th, and 12th graders in hundreds of schools across the country is a substantial and significant increase in vaping. Overall, rates of vaping are second only to alcohol among substances surveyed, with 17.6 percent of 8th graders, 32.3 percent of 10th graders, and 37.3 percent of 12th graders reporting past-year vaping. 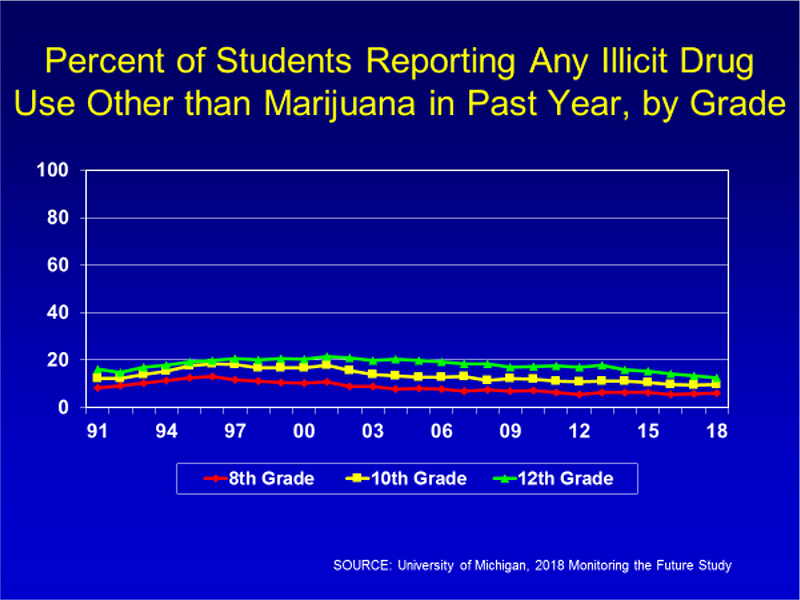 Still, the 2018 MTF results also contain promising trends, with past-year use of illicit drugs other than marijuana holding steady at the lowest levels in over two decades—6.1 percent of 8th graders, 9.6 percent of 10th graders, and 12.4 percent of 12th graders. Among 12th graders, the rate of past-year use of illicit drugs other than marijuana has declined by 30.0 percent in the past five years. For the past three years, many substances have held steady at the lowest levels of use since the survey’s inception (or since the survey began asking about them). In some cases, use has dropped to lower levels than ever before. Substances at historic low levels of use in 2018 include alcohol, cigarettes, heroin, prescription opioids, MDMA (Ecstasy or Molly), methamphetamine, amphetamines, sedatives, and ketamine. Survey findings were mixed in terms of changes in the perceived risk of harm from using various substances and disapproval of people who use them. For example, the percentage of 8th graders who think that occasional use of inhalants is risky is less than it was last year and in prior years. 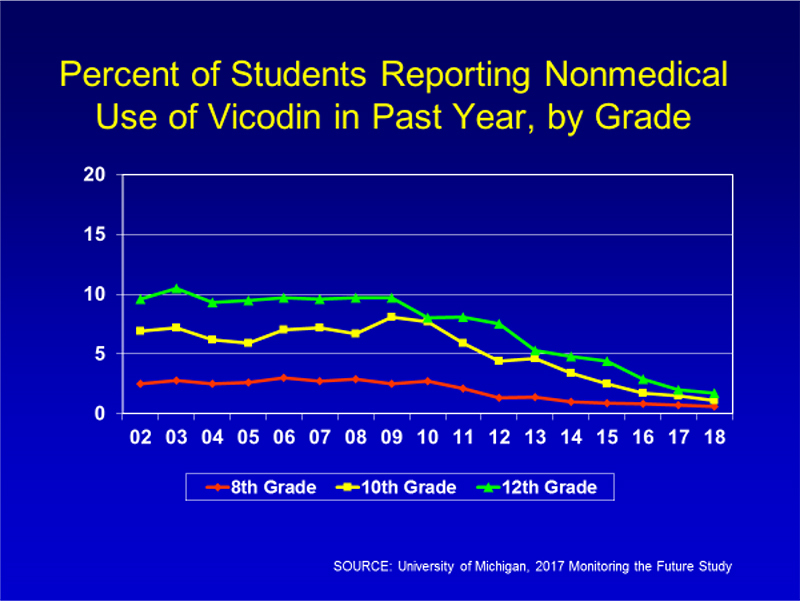 However, among 10th graders, there was an increase in the proportion of students who perceive a risk of harm when trying Vicodin® or Adderall® occasionally. High school seniors also reported increased disapproval of daily drinking, binge drinking, and smoking one or more packs of cigarettes per day. Despite the continued rise in opioid overdose and overall overdose deaths and high levels of opioid misuse among adults, lifetime, past-year, and past-month misuse of prescription opioids (narcotics other than heroin) dropped significantly over the last five years in 12th graders. In the past five years, Vicodin® use notably dropped by 58.4 percent in 8th graders, 75.4 percent in 10th graders and 67.2 percent in 12th graders. 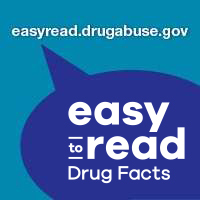 Interestingly, teens also think these drugs are not as easy to get as they used to be. One in three 12th graders (32.5 percent) said that prescription opioids were easily available in the 2018 survey, compared to more than 54.2 percent in 2010. 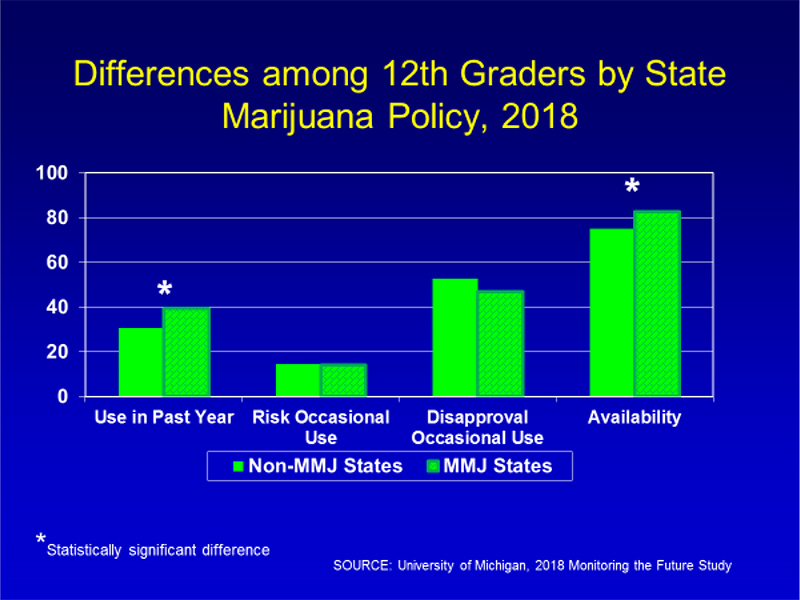 Daily, past-month, past-year, and lifetime marijuana use declined among 8th graders and remains unchanged among 10th and 12th graders compared to five years ago, despite the changing state marijuana laws during this time period. Past-year use of marijuana reached its lowest levels in more than two decades among 8th and 10th graders in 2016 and has since remained stable. Among 12th graders, around six (5.8) percent continue to report daily use of marijuana, which corresponds to about one in 16 high school seniors. Among all grades, perceptions of harm and disapproval of marijuana use have trended downward in recent years. One in four 12th graders report that regular marijuana use poses a great risk (26.7 percent, which is less than half of what it was 20 years ago), and disapproval among 12th graders remains somewhat high, with 66.7 percent reporting they disapprove of adults smoking marijuana regularly. As with other vaping measures, marijuana vaping increased significantly from when it was first measured in 2017 to 2018. While past month marijuana vaping is fairly low—reported by 2.6 percent of 8th graders, 7.0 percent of 10th graders, and 7.5 percent of 12th graders—these numbers represent respective increases of 59.7 percent, 62.7 percent, and 50.6 percent over 2017 rates. Daily marijuana use continues to outpace daily cigarette use across grades, reflecting a steep decline in daily cigarette use and fairly stable daily marijuana use. Alcohol use and binge drinking continued to show a significant five-year decline among all grades. Past-month use of alcohol was reported by 8.2 percent, 18.6 percent, and 30.2 percent of 8th, 10th, and 12th graders, respectively, compared to 10.2 percent, 25.7 percent, and 39.2 percent in 2013. Daily alcohol use and binge drinking (defined as consuming five or more drinks sometime in the past two weeks) also decreased significantly among all grades between 2013 and 2018. Among 12th graders, there were significant declines in lifetime, past month, and daily binge alcohol use between 2017 and 2018. 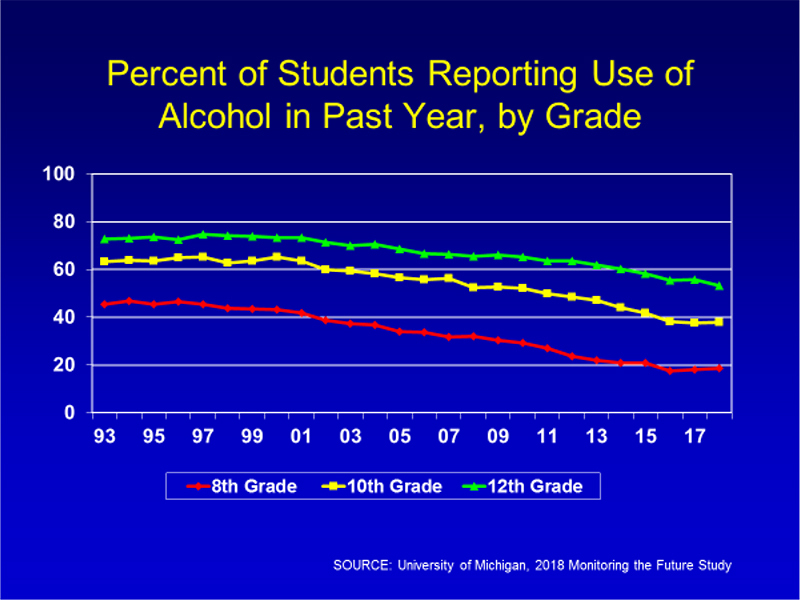 Also, the perception of risk of binge drinking significantly increased among 12th graders in 2018. The percentage of high school teens who reported ever using alcohol dropped by as much as 58 percent compared to peak years. This year’s survey found that 23.5 percent of 8th graders reported ever trying alcohol, which is a 57.9 percent drop from the peak of 55.8 percent in 1994. Among 10th graders, lifetime use fell by 40.3 percent from 72.0 percent in 1997 to 43.0 percent in 2018. Among 12th graders, there was a significant 28.4 percent drop in lifetime alcohol use from 81.7 percent in 1997 to 58.5 percent in 2018. 2018 is the second year in which the MTF survey asked high school students about vaping specific substances ever, in the past year, and in the past month. In just one year, rates of past-year vaping increased by about one-third in all grades, to 17.6 percent of 8th graders, 32.3 percent of 10th graders, and 37.3 percent of 12th graders. After alcohol, vaping is the second most common form of substance use in all three grades. 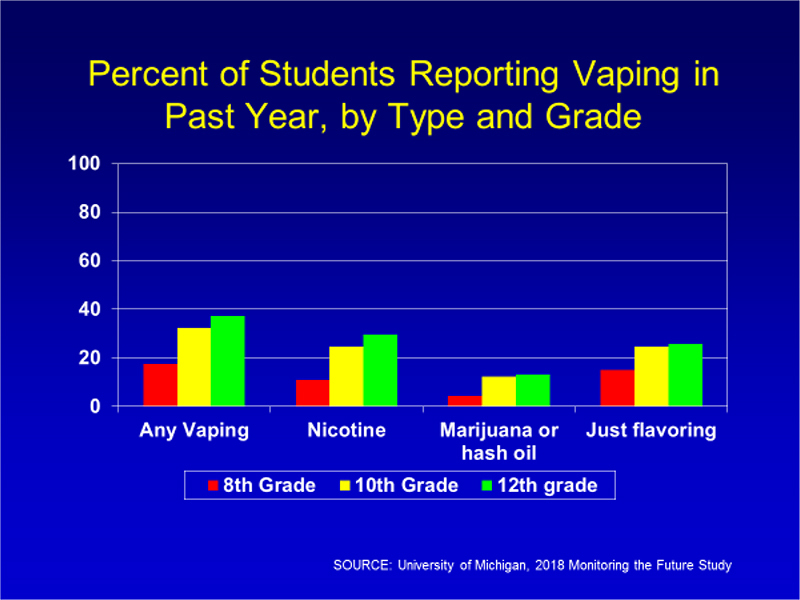 Students were also asked what substances they had consumed via vaping—nicotine, marijuana, or “just flavoring.” “Just flavoring” was most commonly noted by 8th graders (reported by 15.1 percent), followed by nicotine (10.9 percent) and marijuana (4.4 percent). Tenth graders reported identical rates of “just flavoring” and nicotine vaping (24.7 percent), and 12.4 percent of 10th graders reported vaping marijuana. A higher percentage of 12th graders reported vaping nicotine (29.7 percent) than flavoring alone (25.7 percent), and 13.1 percent reported vaping marijuana. It is important to note that students do not always know what is in the device they are using; labeling is inconsistent, and they often use devices bought by other people. The most popular vaping devices on the market do not offer options that are nicotine-free. These one-year jumps in vaping are mirrored by changes in the perception of availability; more 8th and 10th graders reported that vaping devices and e-liquids containing nicotine are easy or very easy to obtain in 2018 than in 2017. The survey data regarding vaping also reveal an increase in the perception of the harm of vaping when nicotine is specifically mentioned. While 22.1 percent of 8th graders reported thinking that it is harmful to regularly use e-cigarettes, 32.4 percent reported thinking that it is harmful to regularly vape an e-liquid containing nicotine. Similar differences were also seen among 10th graders (22.8 percent reported thinking it is harmful to use e-cigarettes regularly versus 31.3 percent who reported perceiving harm in regularly vaping a liquid that contains nicotine) and 12th graders (18.0 percent versus 27.7 percent). Use of traditional cigarettes remains at the lowest levels in the survey’s history. 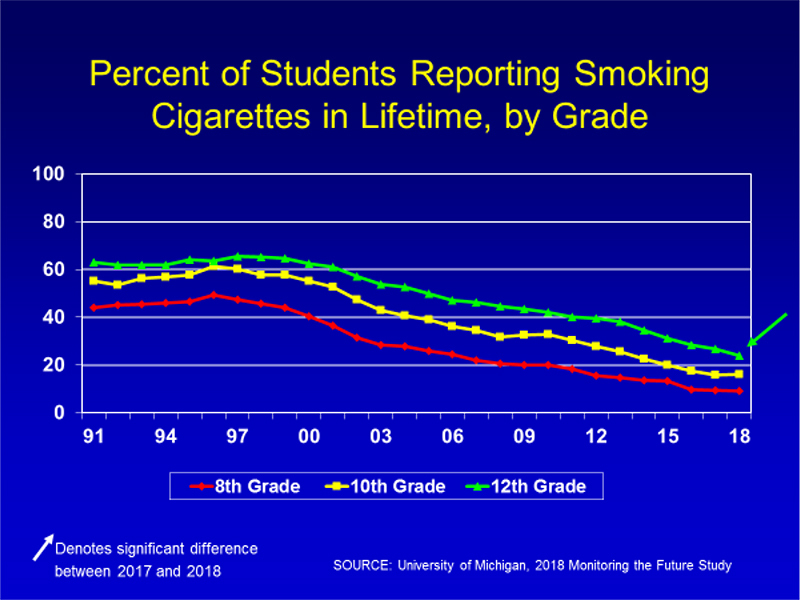 Significant five-year declines—by more than half for daily use and for use of one half pack or more per day—were reported by all grades. Daily cigarette use was reported by 0.8 percent of 8th graders, 1.8 percent of 10th graders, and 3.6 percent of 12th graders in 2018. Lifetime cigarette use among 12th graders decreased from 26.6 percent in 2017 to 23.8 percent in 2018, and past-month use declined from 9.7 percent to 7.6 percent. Use of other tobacco products, including hookah, smokeless tobacco, and little cigars or cigarillos remained low and declined among high school seniors. Among 12th graders, tobacco use with a hookah fell from a high of 22.9 percent in 2014 to 7.8 percent in 2018. Past-year use of little cigars or cigarillos declined in 12th graders from 2017 to 2018, and lifetime smokeless tobacco use shows a five-year decline in 10th and 12th graders. Past-year use of synthetic cannabinoids (K2/Spice, sometimes called “fake weed” or “synthetic marijuana”) has dropped significantly in the past five years in all three grades. Since first assessed in 2011, past-year use among 12th graders has dropped from 11.4 percent to 3.5 percent. Past-year use has also fallen from 4.4 percent to 1.6 percent among 8th graders, and from 8.8 percent to 2.9 percent among 10th graders since first assessed in 2012. The MTF survey began tracking past-year synthetic cathinone use in 2012, and since then, there has been a decrease among 12th graders from 1.3 percent to 0.6 percent in 2018 (synthetic cathinones are commonly known as “bath salts”). 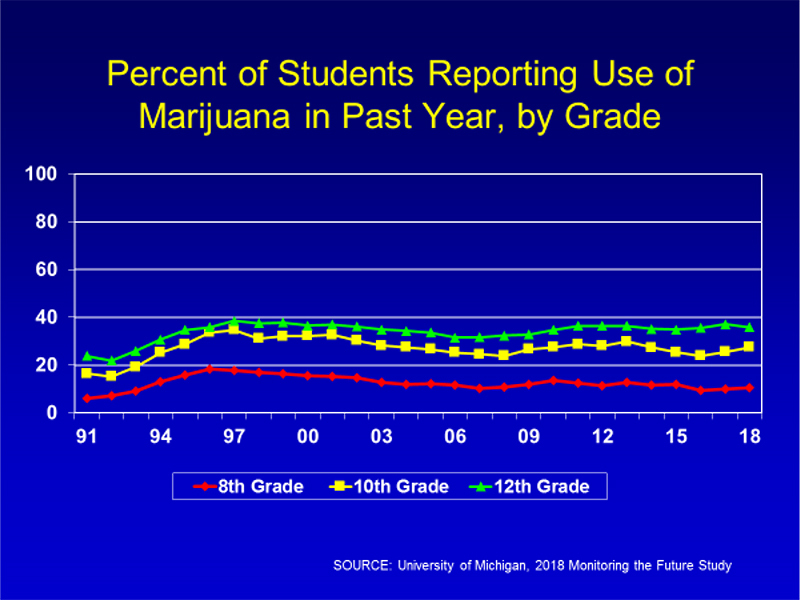 Use among 8th and 10th graders has remained fairly low and flat. NIDA. "Monitoring the Future Survey: High School and Youth Trends." National Institute on Drug Abuse, 17 Dec. 2018, https://www.drugabuse.gov/publications/drugfacts/monitoring-future-survey-high-school-youth-trends. NIDA. Monitoring the Future Survey: High School and Youth Trends. National Institute on Drug Abuse website. 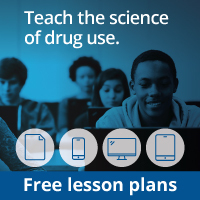 https://www.drugabuse.gov/publications/drugfacts/monitoring-future-survey-high-school-youth-trends. December 17, 2018.